How much screen time is appropriate for toddlers? For anyone with a toddler, turning to an iPad or TV as a babysitter in moments of sheer desperation is not uncommon. But what are the risks of exposing our little ones to screens? In this article, our associate at the Digital Law Company, and mother to 2-year-old, Sarah Hoffman, sets out as briefly as possibly (because if you have a toddler you don’t have time to read this) everything you need to know about screen time for kiddies under 2. I get it, I’m a mother of a toddler who really doesn’t love sleep that much. Well – let me clarify. She does not enjoy sleeping beyond 5am. Ever. And as much as I love and adore her with all my heart and want all the best things for her, I just don’t have it in me to do my scary Gruffalo voice at 5am, or to read Peppa Pig with gusto before my caffeine intake. So, the easiest option at this ungodly hour is to turn to old faithful Sesame Street on Netflix in an attempt to catch a little more shut eye. Is this such a bad thing? Surely a little screen time for my toddler isn’t all that bad? Between 0 and 2 years, an infant’s brain triples in size! This early brain development is determined by environmental stimuli or the lack thereof. The overexposure to screens has been shown to be associated with attention deficit disorders, cognitive delays, impaired learning, increased impulsivity and decreased ability to self-regulate. Say hello to more tantrums. Cartoons and apps are developed create a sensory overload for a child. The bombardment of colour and sound forces a child’s brain to work at a rate of “hyper” processing in order to understand everything it’s seeing. This rate is a lot larger than the rate at which our daily lives are processed, which means that once a child is away from a screen they begin to exhibit hyperactive behaviour in order to try find something to stimulate themselves in the same way the screen did. Excessive screen time has been shown to be associated with subsequent attention problems as well as decreased concentration and memory. When a child watches a ball on a screen, it is a two-dimensional process, however, playing with a real ball provides a three-dimensional experience, including physical movement which enhances a child’s attention and learning ability. Too much screen time can also delay speaking and language skills in children. Studies have shown that children learn language best by interaction and being talked to, from engaging directly with a speaker and taking in their facial expression, body language and tone of voice. This full sensory experience cannot be replaced by what they see and hear on a screen. Too much screen time is preventing kids (and adults too) from leading an active lifestyle by playing sports, being outdoors, reading and interacting with others. Screens are slowly but surely displacing regular childhood activities like playing outdoors, colouring and playing dress up. A study at the university of Texas in Austin showed that an hour of TV viewing in 0-2 year olds was linked to a 9% reduction in creative play in the week and 11 % reduction on the weekend. Too much screen time can create changes in the chemistry of our brain, most notably, in the release of dopamine (also known as the pleasure chemical). This is particularly relevant with video games, where the brain releases dopamine every time you win or progress to a new level. This means that when you aren’t playing the game, you are likely to start feeling down and deprived. All screens give off something called blue light which disrupts the production of melatonin in our brains. Melatonin is a chemical that all human beings desperately need to sleep. Exposure to blue light in the hours before bed-time greatly reduces the quality of sleep, with children spending less time in the REM phase and taking longer to fall asleep. This means that children will feel far sleepier and less alert even if they have received a healthy amount of sleep. In the case of an infant, even if an infant isn’t directly looking at the screen (for example, if a mother is nursing her child on the couch while reading her phone), this can be distracting to the baby and lead to over-stimulation and sleep problems. 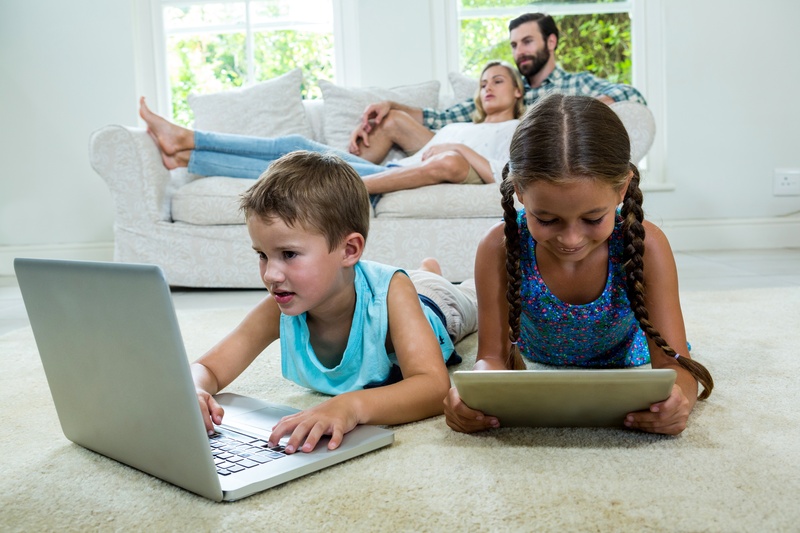 Screens have also shown to causes a disconnect between parents and children. Face-to-face interaction and eye-contact is very important for the brain development of infants. If a parent’s attention is fixed on a screen, a baby is deprived of this attention. What about Facetime or video-conferencing granny? When the AAP issued its policy adjustment in 2016 (adjusting, amongst other things, he off-bounds screen time age from 2 years to 18 month), it also mentioned that video-chatting often used for little ones to communicate with far-away relatives, are not included in the exemption. So you’re not completely at a loss – it’s ok to Facetime or videocall Granny. Plan in advance: the more alternative activities you have on hand for your toddler, the less likely you are to reach for a screen in moments of desperation. Whether its having a pile of books at the ready to look through or researching age appropriate play activities, planning certainly helps. It’s good to be bored – Research has shown the enormous cognitive benefits that arise from allowing children to experience boredom and therefore resort to creativity to entertain themselves. While no one likes the sound of a yelling child, learn to decipher when they are crying because they want attention or when they are crying because of a physical need. Model good phone behaviour – the less we are on our devices in front of our children, the less enticing it will be for them to be connected to a screen. Set boundaries at home, whether its phone-free zones such as the bedroom, meal times, or committing to an hour of device-free time each day on the playmat with your toddler. Turn off the blue light – if you do have to let your kids use a phone/iPad, consider using a blue light filter or an app which syncs a screen’s glow with the sun’s daily patterns (For example Night shift mode on an iPhone), making your screen brighter in the morning and dimmer at night. This reduces the amount of blue light emanating from your screen at bedtime. But what about the real world? I have dinner to cook! While this may all make sense, most of us, can’t spend all day on the play mat making DIY mobiles for our toddlers. There are dinners to cook, work calls to answer and other family members to attend to. Sometimes, the screen is really the only available solution to give you those ten minutes of peace. The answer, as with most things is moderation: if a tiny amount of screen time means saving you from a nervous breakdown of epic proportion, or it means you will be a saner and calmer parent – do it, but if do have to use the screen, we suggest you choose high quality programmes. Common Sense Media is a brilliant tool for recommending age-appropriate shows. For more information on screen time for children and toddlers, The Digital Law Company provides presentations for schools and companies on Screen Time for Little Ones.